In the immediate and long-term future, Sub-Saharan Africa (SSA) will face significant challenges related to climate change (CC), natural resource depletion and poverty. In a recent paper, we emphasize three particular issues that were identified by comparing the recent performance and future projections for SSA and those of other regions. The first issue is the distribution of burden; most low latitude countries in SSA will face considerable exposure to the consequences of CC despite a relatively low contribution to global greenhouse gas (GHG) emissions. The second is the combination of high population growth, weak governance and economic dependence on the exploitation of increasingly scarce natural resources, which presents serious risks of poverty traps. Third, climate change could be driving migration and urbanization in the region, which, in turn, could be cause for conflict and increase SSA’s carbon footprint. These challenges call for greater commitments by OECD countries to address the mismatch between contribution to global greenhouse gas emissions and climate burden, halt natural resource depletion, and support low-carbon urbanization in SSA. To date, SSA’s contribution to global carbon emissions has been negligible; in 2015, SSA’s contribution was only 2.3% of total global emissions. However, due to its low-lying geographical position, SSA is expected to suffer greatly from the effects of climate change (low lying regions show a higher rate of sustained extreme temperatures). According to some forecasts, SSA drylands will stretch across 43% of total land area, 70% of croplands, and 80% of land currently used for livestock. Expected consequences are severe and range from public health crises, significant productivity loss (particularly in the agricultural sector – a key economic pillar in many SSA countries), and increased rates of violence. Research suggest that productivity losses from extreme temperatures will persist over time in poor countries due to low capacity for resilience. 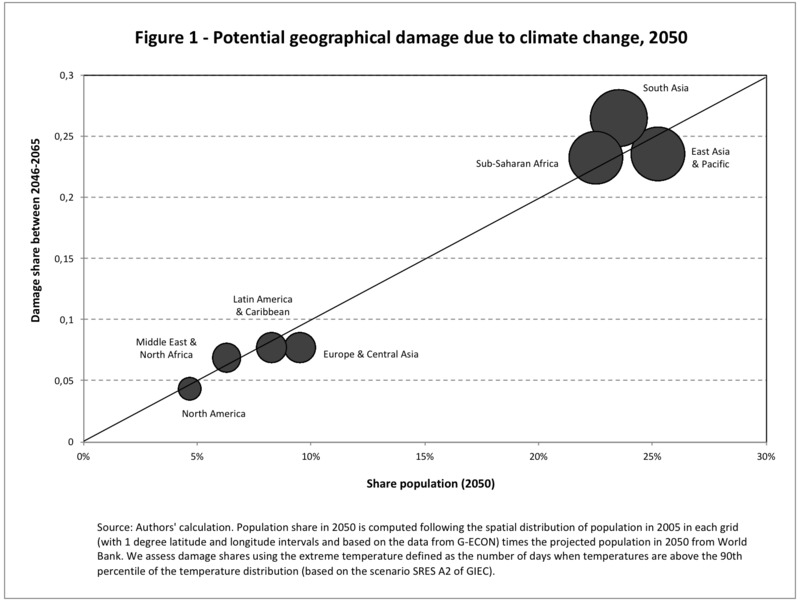 The lopsided distribution of expected damages across regions is evident in Figure 1, which illustrates potential damage due to climate change relative to population share by region. The 45° degree line separates regions with predicted damages greater (above the line) or lesser (below the line) than population shares. Natural resource depletion is a serious concern in countries with weak governance. This is particularly problematic in SSA, where natural resources account for a high percentage of exports (in 2014, 71% of SSA’s exports were raw materials), and where many communities rely on natural capital for livelihoods and survival. 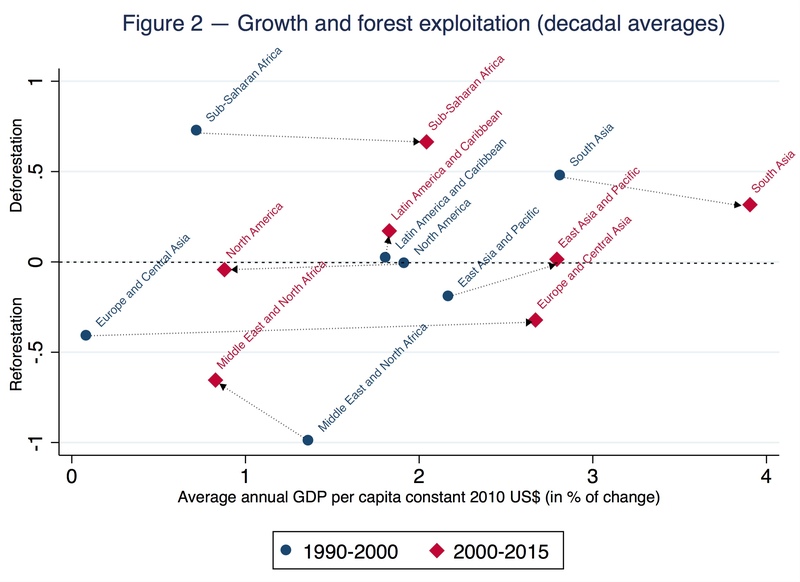 Moreover, estimates of the elasticity of poverty to growth are lower in SSA than in other regions, likely due to the spatial distribution of the poor on less favored and remote agricultural lands. Should this persist, it will be difficult for SSA to reach the average per capita income needed for the population to be able/willing to contribute to natural capital protection through environmental taxes. In such a case, scarcity rents should be re-invested in human capital through, for example, skills development and vocational training programmes, in order to sustain growth and protect natural resources – another challenge in weak-governance zones. Finally, if UN population growth projections are approximately accurate, there will be considerable redistribution of population across regions before the end of the century. Without successful climate adaptation initiatives, mass migration towards regions with a more favorable climate will sharply raise the likelihood of conflicts. This all paints a grim picture for the future of the culturally- and biodiversity-rich region of SSA, as well as for global emissions (to be discussed in the following section). Swift and significant action is needed to ensure that SSA is financially supported to pursue a low-carbon development path, and that governments, businesses and citizens are equipped with the skills, knowledge and incentives needed to develop a green economy. Implications of urbanization for GHG emissions is the third challenge examined in our paper, and these challenges are global scale. On average, GHG emissions in urban areas are three times higher than in rural areas. By 2030, SSA is expected to hit a record high rate of urbanization, with half of its total population living in urbanized areas. This would potentially require 15 percent of the world’s remaining carbon budget. In light of these findings, OECD countries have a strong common interest in effecting financial transfers to low-income countries, particularly in SSA where natural capital depletion urgently needs to stop and countries require significant financial and technical support to pursue a low-carbon path to urbanization. So far, donor countries have pledged $US 100 billion, but this is well below the estimated levels of financial support that are required. A 2016 UN Environment report estimates that $US 90 trillion is required to achieve the Sustainable Development Goals and the climate objectives set out in the Paris Agreement, and the World Bank estimates that mitigation will require $US 140-175 billion and adaptation will require $US 75-100 billion per year until 2030. As an example of monitorable financing, reducing deforestation rates by half in SSA would cost approximately $1.93 billion a year. In addition to greater financing efforts, improvements in governance are necessary in the SSA region. This could be achieved, for example, through financing a slowdown in deforestation rates which can be monitored by satellite, making results-based transfers implementable. Initiatives for more transparency in governance include the Extractive Industries Transparency Initiative (EITI), which contributes to improve governance in mineral-rich and oil-rich countries, many in SSA.